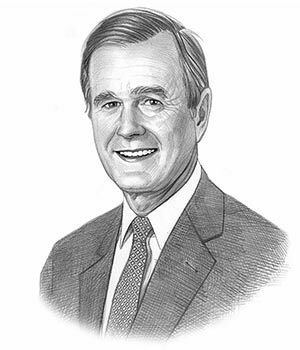 Summary of President George H W Bush for Kids: "Poppy"
Summary: George H W Bush, nicknamed the "Poppy", was the 41st American President and served in office from 1989-1993. The Presidency of George H W Bush spanned the period in United States history that encompasses the events of the Modern Era and the rise of terrorism. President George H W Bush represented the Republican political party which influenced the domestic and foreign policies of his presidency. The major accomplishments and the famous, main events that occurred during the time that George H W Bush was president included the Gulf War led by coalition forces in Operation Desert Storm, against against Iraq that was led by Saddam Hussein and the terrorist organization, Al-Qaeda became, known to the west. At home the Exxon Valdez oil spill caused an ecological disaster, the Environmental Protection Agency (EPA) was established and the Clean Air Act was signed into law. The next president was Bill Clinton. The summary and fact file of George H W Bush provides bitesize facts about his life. The nickname of President George H W Bush provides an insight into how the man was viewed by the American public during his presidency. The meaning of the personal nickname of "Poppy" relates to a family nickname. His grandfather was known as 'Pop' and his grandson, the young George, was called 'Poppy' or 'Little Pop' by the family. The character traits of President George H W Bush can be described as diligent, practical, persuasive, loyal, ambitious, unpretentious, determined and forceful. It has been speculated that the Myers-Briggs personality type for George H W Bush is an ISTJ (Introversion, Sensing, Thinking, Judgement). A reserved, well-regulated and serious character and a strong traditionalist. George H W Bush Personality type: logical, organized, sensible, thorough and dependable. Summary of the Cold War: The Cold War was a 'war of words' involving the Cold War Space Race and the Cold War Arms Race involving the nuclear build-up between the USA and the West and the Communist countries dominated by the USSR and China in the East. George H W Bush was one of the nine US Presidents who were in office during the dangerous period in history known as the Cold War from 1945 - 1991 in which the US adopted the policy of Containment to restrict the spread of communism abroad. Summary of the Fall of the Berlin Wall: The Berlin Wall went up on 13 August 1961 to block movement between the Soviet sector and the western sector of Berlin, Germany. The Fall of the Berlin Wall began on November 9, 1989 symbolizing the fall of communism and the birth of democracy in the Iron Curtain countries. Summary of the Collapse of the Soviet Union: The Collapse of the Soviet Union and the End of the Cold War was prompted by the policies of Glasnost and Perestroika inadvertently opening the floodgates for political demonstrations against the restrictive Communist-led governments of the Eastern bloc. The Soviet president Mikhail Gorbachev resigned as on December 25, 1991, the Soviet Union collapsed and the Cold War finally came to end during the presidency of George H W Bush. Summary of the Tiananmen Square Massacre: The Tiananmen Square Massacre on June 4, 1989 in Beijing, China when Chinese troops stormed through Tiananmen Square firing indiscriminately into the crowds and killing hundreds of pro-democracy protesters. Summary of the Exxon Valdez oil spill: The ecological disaster caused by Exxon Valdez oil spill occurred during the presidency of George H W Bush on March 24, 1989 when the Exxon Valdez oil tanker, en route from Valdez, Alaska to Long Beach, California, struck and was grounded on Bligh Reef in Prince William Sound, Alaska. The 1990 Oil Pollution Act was passed to make tankers safer. Summary of the Americans with Disabilities Act: The Americans with Disabilities Act was signed into law by George H W Bush on July 26, 1990 to protect the civil rights of individuals with disabilities. Summary of Operation Desert Storm: The lead up to hostilities in the Gulf War began during the presidency of George H W Bush with the "wholly defensive" mission called Operation Desert Shield (2 August 1990, to 16 January 1991) in which US forces gathered in the Saudi Arabia and the Persian Gulf. Iraq failed to meet the deadline to withdraw from Kuwait which led to Operation Desert Storm (17 January 1991 – 28 February 1991), the operational code name for the combat phase of the Gulf War. Summary of the Gulf War: The Gulf War (2 August 1990 – 28 February 1991) between coalition forces from 34 nations led by the United States against Iraq led by Saddam Hussein began during the presidency of George H W Bush. The Gulf War erupted in response to Iraq's invasion and annexation of oil rich Kuwait. The Gulf War was a heavily televised war and every night people watched live pictures of the conflict. The Gulf War ended on 28 February 1991 WITH victory for the United States and the coalition forces. Summary of Al-Qaeda: The radical Islamic group Al-Qaeda, led by Osama Bin Laden, was formed in 1988 - 1989. The intensely anti-American Al-Qaeda established training camps in Afghanistan. The George H W Bush administration witnessed the emergence of the terrorist group Al Qaeda whose members would eventually be responsible for the terror attacks on the United States and their citizens. The Cold War had ended but the War on Terror was about to begin. The article on the accomplishments of George H W Bush provides an overview and summary of some of the most important events during his presidency. The following George H W Bush video will give you additional important history, facts and dates about the foreign and domestic political events of his administration.